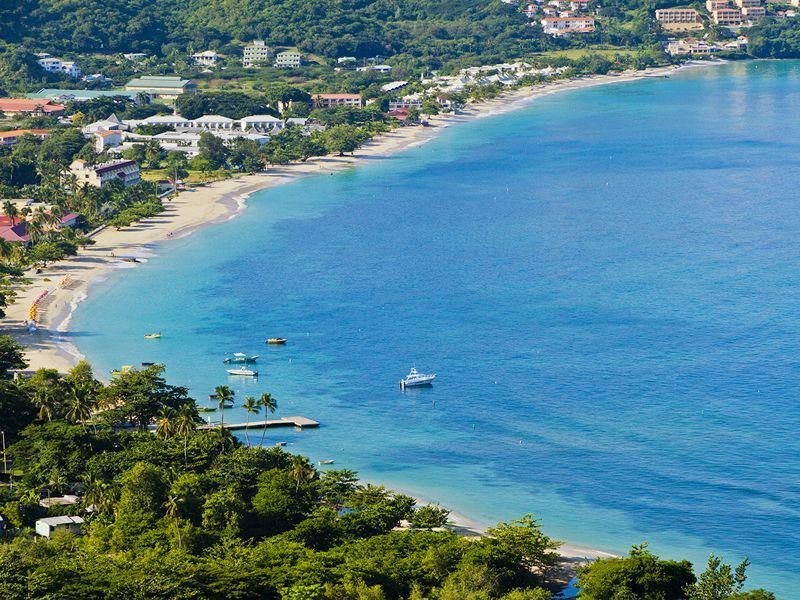 I had read a great deal about Grenada before visiting and expected to like the place. The idea of a green, cool interior, waterfalls and an interesting cultural history differentiated it from other Caribbean islands I had visited. Prior to hopping over to Grenada, we had spent a week in Barbados, which acclimatised us, preparing us for beautiful beaches and aqua seas. Swimming with turtles had been a highlight in the sea off Holetown and we had enjoyed ourselves. Moving onto Grenada could have been a tricky move — how would it match up, would we be disappointed? The juddering mini-plane to Grenada was so noisy we all wore ear plugs; it was deafening. On arrival at Grenada I could hardly hear anything that was being said to me, but I could take in the immediate beauty of the island. I was also really taken by the people — chilled, old school, courteous and I didn’t feel that they were being nice to ingratiate or be paid. Grand Anse Beach was as spectacular as we had been led to believe. It was a Saturday, so probably as busy as it was ever going to get — and we loved it. We dumped our bags quickly and went onto the beach. The talcum sand felt so clean and by midday, hot. The hotels and resorts which border the beach put sunbeds and hammocks in front of their hotels so you relax comfortably. The sea is equally good right along the whole stretch of the bay, but in my opinion, the central stretch looking northeast, is better than the rest. The Spice Island hotel has a lovely stretch of sand in front of it too. The sea is initially shallow, cooler than Barbados and fresher, the sand obviously made up of crushed coral and shells. You can swim out and get deep quickly in the sea, with visibility amazing. I hardly saw any fish unless we swam around the snorkelling rocks at the edges of the bay. The most beautiful thing we saw in abundance were huge bright red starfish; they shone out from quite shallow depths and urged you to swim deeper to touch them. They looked unreal and only when you touched them did the fact they were alive become apparent — not because they moved, just that they were soft. Please do not take them out of the sea — I’m stunned when I speak to people who think that’s perfectly ok. In terms of water sports — it’s all going on. At Spice Island – or at a number of beach side vendors, you can arrange a diving expedition. I found them all to be licenced and with good local knowledge on reef dives and sunken boats plus they knew exactly where the big fish and sharks were hanging out at that time of the year. There is one vendor with a burn mark on his leg (he dropped hot oil on it when younger) who can arrange trips to sand bars and cook up fish you catch en-route which is fun, or get him to run the banana boat around the bay for the children. There isn’t a lot of noise on the water — it seemed relatively quiet and it is big so maybe the bay absorbed us all. There are a number of local eateries on the beach, especially to the northeast side, which we enjoyed — I guess these change each season. Local vendors sell pineapples and fruit on the beach — alternatively, visit the supermarket directly behind Coyaba on the beach. We felt very safe on Grand Anse Beach. The vendors were gentle and humorous rather than drug-addled and cross. Our children joined a local’s cricket game on the beach, the “locals”, not being that local but visiting from the east coast of the island and from the villages in the interior. A day out at the beach is a treat for more than just British children! Between Grand Anse and Point Salines, there are a total of six white sand beaches (not including one or two small stretches of sand), all of which are easily accessible and usually even quieter than Grand Anse. It’s definitely an idea to catch a ride and explore this glorious island – whether that’s to enjoy alternative beaches, visit the capital St George’s or to head on up to the lush interior at Grand Etang Forest Reserve. Article written by Billy Hawkins.